Niagara Falls is constantly moving backwards! The rim is worn down about 8 meters each year because of the millions of gallons of water that move over it every minute. 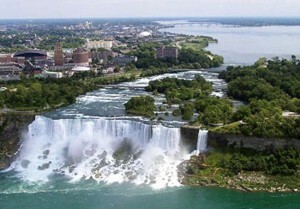 Although the Niagara Waterfalls are not exceptionally high, they are very wide. Their length of brink is 1060 feet while their height is 176 feet. Niagara Falls are one of the most powerful waterfalls in North America. The word "Niagara" is derived from the Indian word "Onguiaahra" meaning "the strait"
Many years ago, tourists would sketch pictures of the Falls because the don't have cameras. In the evenings, intense spotlights bathe the falls with different shades of color.